Vogue recently launched new iPhone app called Vogue Stylist. It is advertised as an app for taking pictures of your own wardrobe, as well as shopping for items selected by Vogue stylists either by browsing the Trends or searching for brands advertised in the current eddition of Vogue. - Each trend category comes with complete look suggestions: for example, when you click on The Trench trend, you are given suggestions for shoes, bags and accessories to go with the trench. - The app has a simple & logical layout and is very easy to navigate. - Approximately 1/3 of all items are from the High Street and remaining Designer picks are reasonably priced. - Each month we are promised over 600 accessories and the March issue alone covered over 91 brands (including Kate Spade, Nine West, Ann Taylor, Valentino, and Giuseppe Zanotti). - Once you find something you want to buy, Vogue takes you straight to the check-out on the retailer side! The app also gives you a list of stores near you. - The app covers US Vogue and US retailers ONLY! - The selection of items is limited to monthly Vogue edition and the main advertisers. - I took several photos of ads in the US Vogue March edition and each time got an error message saying that the ad was not recognized. More importantly, I’m hardly ever interested in ads in magazines. I’m more interested in searching for items covered in spreads and articles. I’m sure Vogue advertisers were delighted with this feature, just not the end user. - I tested practically every suggestion within the Stylist trend categories, and found them to be somewhat generic – nothing exciting and fresh. I have an inkling Vogue looked to Shopstyle.com, Polyvore.com and Fashionair.com for direction when developing this app. The Shopstyle site and mobile app are second to none in their coverage of current trends, brands and retailers in US and EU. It also allows users to save their favorite items, ensemble complete looks and share them with friends and the Shopstyle community. In the case of Polyvore and Fashonair, they both mastered the concept of online wardrobe personalization: Fashionair allows users to upload their own photos, make whishists and much more. 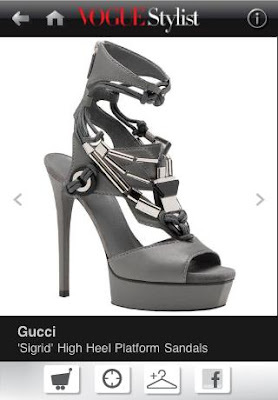 I'll be sticking to using Shopstyle on my iPhone for browsing the web for current trends and comparing the prices. That said, I give Vogue Stylist thumbs down!